Yes, friends, as it turns out, there is such a thing as TOO MUCH WATERMELON. You might have eaten TOO MUCH WATERMELON if you fall down on the deck with a groan and gaze vacantly at the sky. That might be a good indication that it's time to cut yourself off. 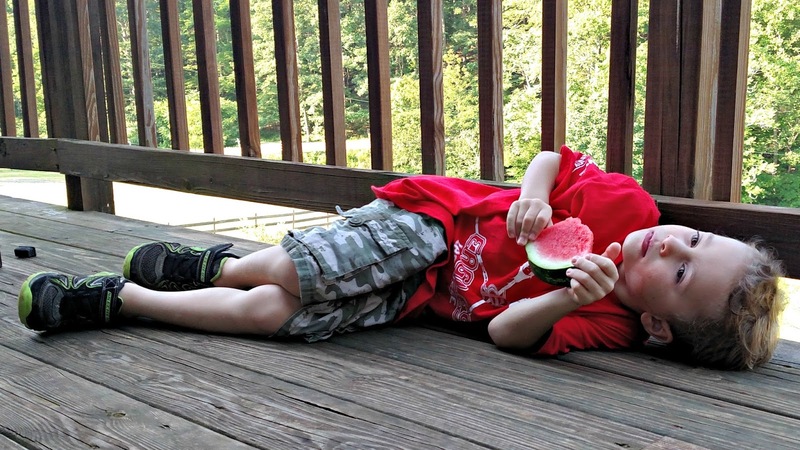 Readers, do you love watermelon THIS much? Can there be too much watermelon? Ha ha, Deep Thoughts...and watermelon. That's some powerful watermelon! Unfortunately, my weakness is ice cream! Bah, he ain't even bloated yet!!! Poor Cort! That last piece was just too much. :-) I didn't know this condition existed. We have some in the fridge right now--sooo good. It is fun to get the seeded kind and spit seeds to the chickens. Oh my goodness, how cute! I understand how hard it is too quit, I love watermelon too. TOO funny! And your picture is adorable! I have never eaten watermelon, but might give it a try this summer. Phil likes it, but claims it is too much trouble to be worth it. I even try to get him to buy those little ones with no seeds. Japan has made square ones! So they will fit in the corner of the fridge. We just ate a whole watermelon yesterday! (not me...our family!) :) He's a cutie! If only there was more watermelon in my life, I wouldn't have a donut around my middle. *sigh. Truth. He's still got a grip on it....there is still hope! My daughter and I loveeee watermelon. But try not to eat it too much :). He looks cute.. I do love watermelon but I don't buy it often enough because I don't enjoy cutting it up! I like it, but don't LOVE it. It's hard for me to find one that's just right. I need tips. Not a fan of watermelon really, but I love the picture!